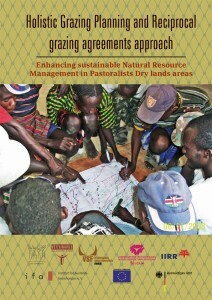 Holistic Grazing Planning and Reciprocal grazing agreements approach. Enhancing sustainable Natural Resource Management in Pastoralists Dry lands areas. This book is divided into two parts. The first part (Holistic Management – Field Manual & Application) has been designed as a field manual that has captured the main elements of holistic grazing planning so that it may be taught and implemented easily in field situations for pastoralists. It highlights the benefits of holistic grazing planning. Pictures, illustrations, and hands-on exercises have been used to convey the information. Ten topics have been identified to help users of this book appreciate the importance of Holistic Management (HM) Approach. It further provides practical experiences with regard to the application of the HM approach among the Dasanach Community in Kenya. The second part of this book highlights the importance of shared resource use practices in pastoral areas using the Reciprocal Grazing Agreements (RGA) Approach. It is envisaged that users of this book will learn from experiences highlighted herein with regard to developing the RGA. It is our hope that this book will be invaluable to individuals and organisations supporting the livelihoods of pastoralists.